If you, your kid, your neighbor, and the person standing next to you to order coffee likes puzzler iOS apps, the Flow Free iPhone, iPod Touch, and iPad app is an absolute must. The graphics are crisp and bright, and the quantity and quality of puzzles makes it accessible, addictive, and appealing to virtually everyone with an iOS device. The Flow Free iPhone app opens with a column of simple choices and an ad bar at the bottom of the screen. The graphics of the game are striking–bold primary colors juxtaposed with a solid black screen. From the home screen, you can select free play, time trial, settings, about, and more games. The about section gives you a concise and helpful description of the game play. You connect the dots of the same color on a matrix grid, but none of the paths can intersect. You can select between two modes of play. The free play selection has an unusually large selection of game choices grouped into three categories–easy, medium, and hard. As the games increase in complexity, the puzzles become larger. There are 120 easy and medium puzzles and 30 hard ones in the free version. To play against the clock, you select time trial settings. You can select from different puzzle sizes and times to test your ability. The game play interface is efficient and interesting. You touch the bold dot and slide your finger to the desired position. The gestures are intuitive and responsive. You can keep track of your puzzle solving by watching the numbers at the top of the screen. Since the object is to connect the dots of the same color in as few moves as possible, you can monitor the number of moves you have made and compare yourself with the best possible way of solving the puzzle. You can access hints in the lower right hand corner of the matrix grid, and you can undo your most recent gesture by touching the double arrow icon just below the grid. Since virtually everyone in our family plays the Flow Free iOS app on different devices, we’ve noted that the smaller screens make puzzles easier. My son plays Flow Free on his iPad mini, but switches to his iPod Touch for the more difficult puzzles. 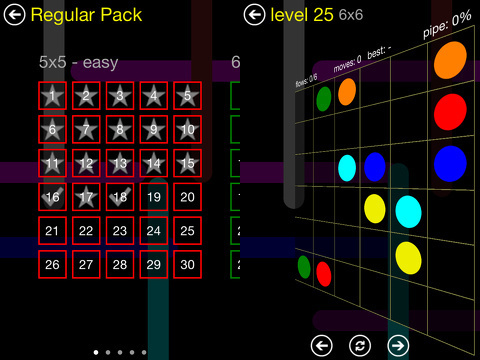 The smaller screen makes the puzzles more compact, so you can more easily determine the paths. The Flow Free iPhone app is supported by ads. You can purchase an ad-free package for $3.99. There are also multiple selections depending on the size and type of puzzles you like to solve for $.99 to remove some ads. Parents will specifically appreciate that there is a kids pack for $.99. The ads are not obstacles to the game play, but they are distracting and worthy of the small in-app purchase to eliminate them. 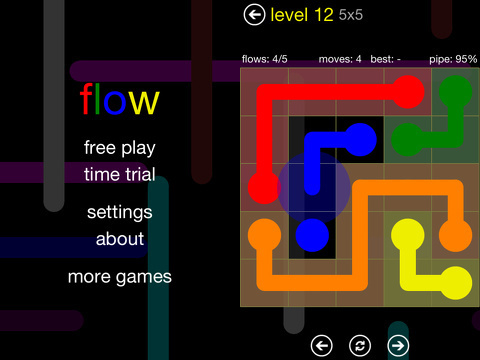 AppSafari review of Flow Free was written by Jenni Ward on January 22nd, 2013 and categorized under App Store, Free, Fun, Games, iPad apps, Kids, Kids, Puzzler, Universal. Page viewed 6495 times, 1 so far today. Need help on using these apps? Please read the Help Page. Just a warning. Ads pop up after playing a few boards. Some ads are inappropriate. My four year old plays this and I don’t appreciate miley cyrus’ half naked booty being flashed in his face. Then they make it so difficult to close it out…every time we hit the x it simply takes us to the app store. Sorry. Not downloading. Seriously. Beware. Move to Android and Google Play.